The sporty, refined, and lean Slice Flipper is an everyday carry knife that won't get old. 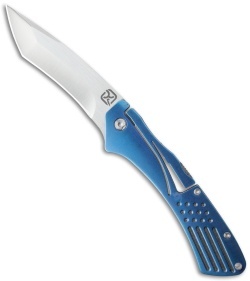 It has a recurved tanto blade and blue plated stainless steel handle with satin accents and a polished pocket clip. 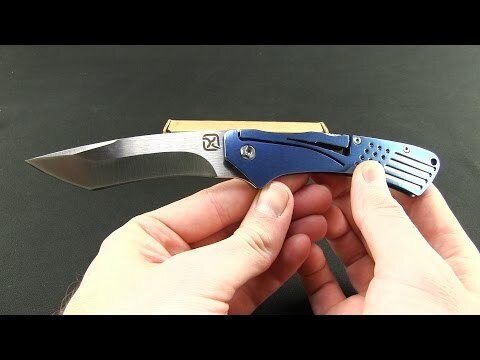 This knife utilizes the Klecker-Lock, which acts in a manner similar to a standard lockback, but the difference lies in the ingenious cutout of the stainless steel handle itself to create the integrated spring and locking mechanism without the need for additional components. It's simplicity at its best. First the good: The blade slices well, due to its thinness and hollow grind. And it looks good. Now the bad: it does not flip into locked position with just the flipper. You need to start with the flipper, but finish with a wrist flick. It is not as secure a lock as other locks. I cut a tie cord with reverse grip and when it got through the plastic, it unlocked. 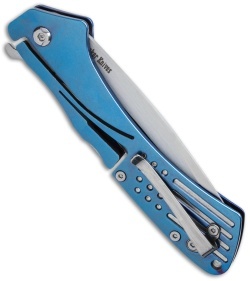 The grip does not inspire confidence since the steel cutouts seem to move slightly with hand pressure. I'll probably retire it from EDC.